Rotorua GP CME is New Zealand's largest annual General Practice meeting and exhibition - www.gpcme.co.nz This national meeting is run in conjunction with the New Zealand Medical Association. Content focuses on short, sharp and to the point clinical content, including key take home messages to change practice behaviour immediately. 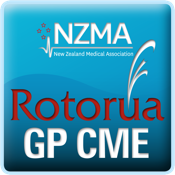 Due to the popularity of the Rotorua GP CME meeting, the committee now also offers an annual South Island meeting, currently held in Dunedin - www.gpcme.co.nz/south Both meetings are endorsed by the Royal New Zealand College of General Practitioners for CME and MOPS purposes. All General Practitioners, Practice Nurses, Practice Managers and Students are invited and encouraged to attend.